he year was 1987 … the 550 Building was completed the previous year. The economy wasn’t good and there was more space available in the market than tenants to occupy it. In an effort to draw attention to the building, developer Al Sakolsky, and his partner, Ed McBride, wanted to do something outstanding for the holidays. Something to put the building on the map. Then we found the poinsettia tree. Made of steel and constructed like gym equipment, this was a “decoration” that would last for years. 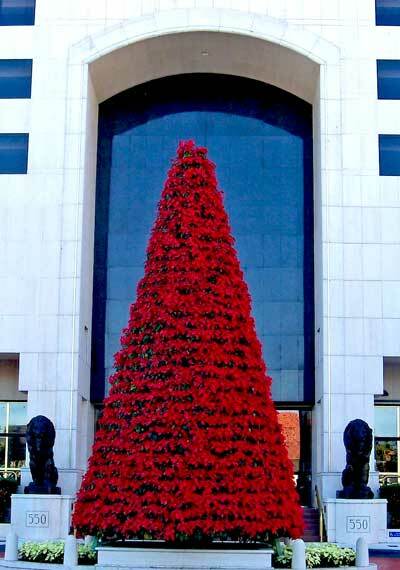 Just erect it and buy the 1,200 poinsettias to decorate the tree. The engineers designed the superstructure to secure it over the fountain. Bachman’s, (who had built 25 ft. trees for Rockefeller Center and Disney World) built the frame. It would be signature to the 550 Building. The tallest poinsettia tree in the world. And at 32 ft., it still is! The Partners felt that since they were spending $20,000 on the Poinsettia tree, we should at least have kids singing Christmas Carols in front of it … And so the Competition was born! That first year the partners funded all the prize money. We put together a “panel” of judges that had musical credentials and invited every school in Miami to participate. Fifteen came that year. The building tenants, the neighbors and the folks at City Hall really loved the event. It took on a life of its own. The partners continued to underwrite it, building tenants became sponsors. In 1992 it was added to the Merrick Festival, which made it possible to apply for public grants. It is that grant money that has helped to fund the growth and development of the event that the Caroling Competition has become. Merrick Festival showcases the performing arts in our community, presenting free performances at public venues. The Merrick Festival’s annual Caroling Competition focuses attention on the importance of returning music to school curriculums. It supports the development of the talented young people in school-based vocal programs, awarding cash prizes, designated specifically for the use and enrichment of the school’s vocal programs. To this end, since 1987, Merrick Festival has donated nearly $300,000 to the school music programs in Miami-Dade County. Thanks for your email. We're usually able to get back to you within 24 hours. I consent to Merrick Festival Caroling Competition | Coral Gables, Florida collecting my details through this form.